The Magic of Mexico – The Great Canadian Travel Co. 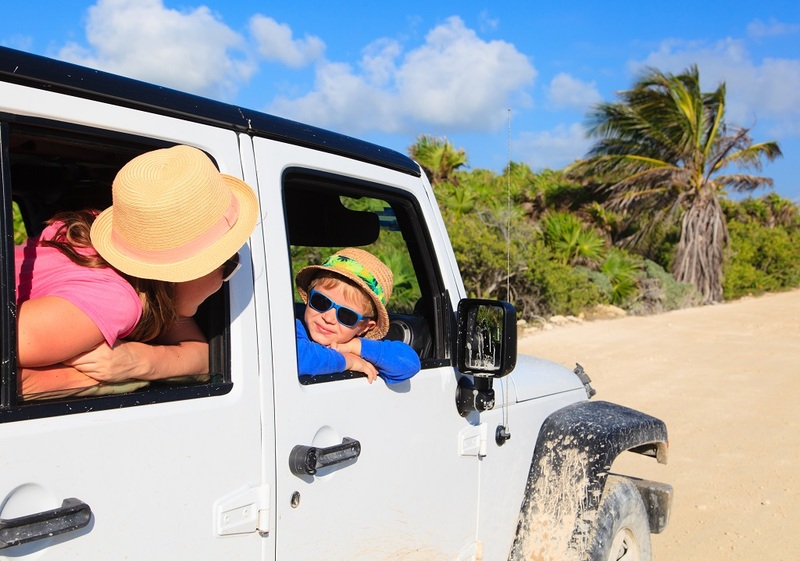 Discover magical Mexico on this family-friendly adventure while you explore and discover its natural and cultural wonders. From the sacred Mayan temples of Chichen Itza to the white sand beaches of the Yucatán Peninsula, Mexico is a country full of colourful traditions and magical surprises. 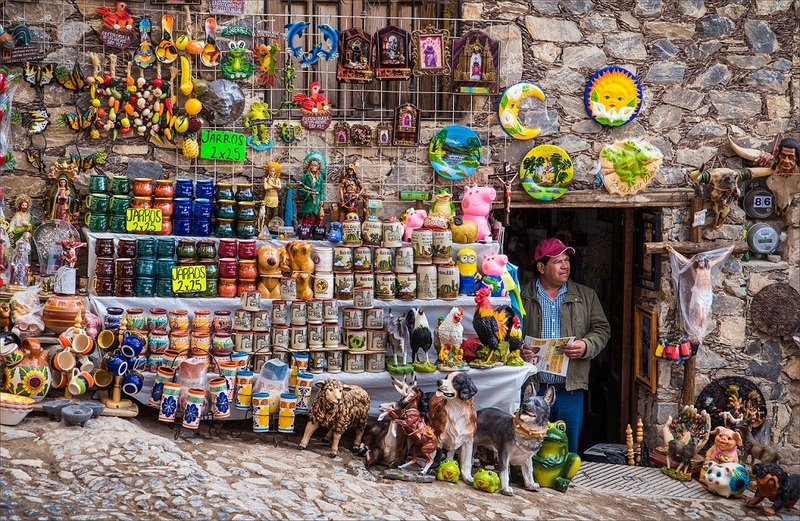 Come and let Mexico reveal it’s secrets to you. Prices are shown in CA$, per person, based on two adults sharing a twin room or one adult in a single room. Child pricing applies to children ages 8-14. Children 15 and older pay the applicable adult price. Final pricing is subject to the room configuration required for the number of adults and children and may differ slightly from the pricing shown. Usually arriving in Cancun in the afternoon, you will have the evening to check into the hotel and relax before your tour starts. No previous travel experience is required for this leisurely trip and it is suitable for any fitness level. So relax and enjoy the outdoors. This morning after breakfast your tour leader will conduct the main group briefing before leaving the hotel in Cancun and travelling south (approx. 40 min) to the Caribbean beach town of Puerto Morelos. Here you will have the chance to enjoy the beautiful beach and have lunch next to the Caribbean Sea. In the afternoon you will be transferred (approx. 2 hrs 30 min) to the colonial town of Valladolid, where you will stay for the next 2 nights. In the morning you will take a short drive (approx. 55 min) to the most well-known Mayan temple city, Chichen Itza, which served as the political and economic centre of the Mayan civilisation. Here youe are able to explore its numerous structures that can still be seen today including the pyramid of Kukulkan, the Temple of Chac Mool, the Hall of the Thousand Pillars and the Playing Field of the Prisoners. 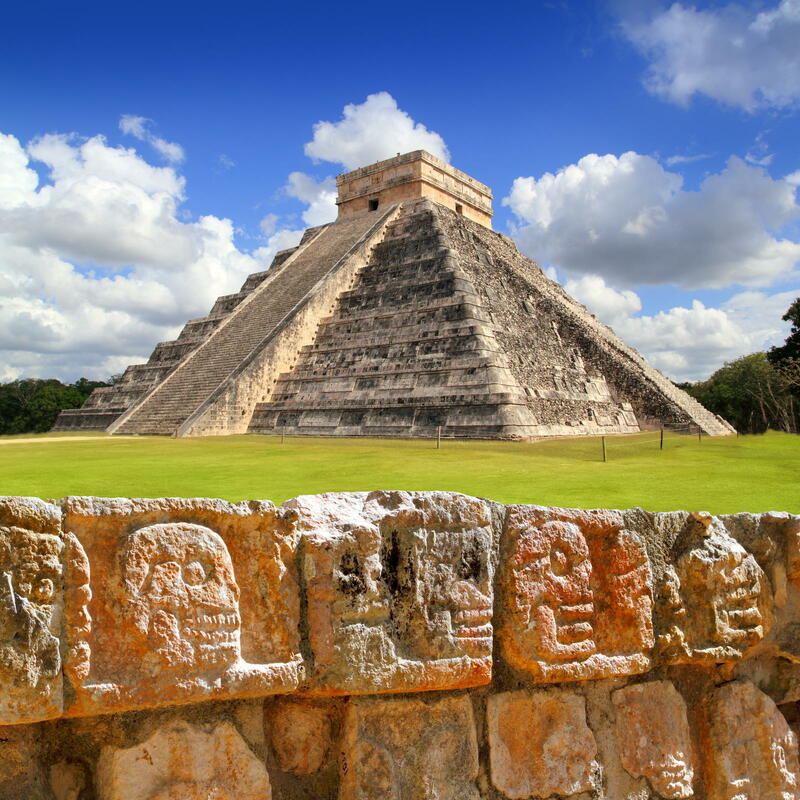 The pyramid of Kukulkan was the last of the Mayan temples and is arguably considered the greatest. After visiting ancient Chichen Itza, you will head (approx. 10 min) to Cenote Ik-kil, one of Yucatan’s most enchanting freshwater underground pools. Here you can opt to take a refreshing swim in the cool water or simply admire this natural wonder before enjoying a buffet lunch (not included). In the afternoon you will be transferred (approx. 45 min) back for your final night stay in Valladolid. This morning after breakfast you will visit Valladolid’s vibrant local market where there is the chance to taste different fruits and discover other exotic local produce. Leaving Valladolid, you will be transferred (approx. 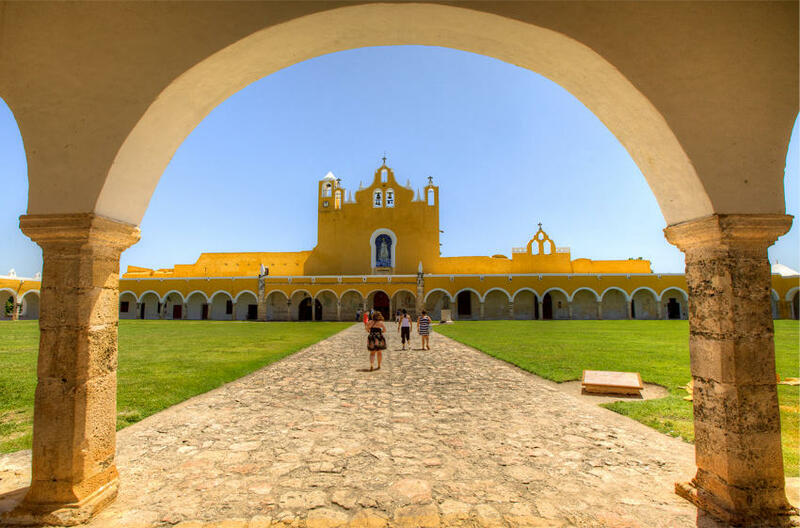 1 hrs 30 min) to Izamal, a former Mayan settlement meaning ‘Place of the God of Medicine.’ Today it is considered a magic town, where every building is painted yellow and white and is well-known for the 16th Century Franciscan monastery that was built upon the base of a Mayan pyramid. In Izamal you will roll up your sleeves and take part in a cooking class to prepare your lunch consisting of Mexican favourites guacamole, salsa and a surprise lunch speciality. After lunch, you will be driven (approx. 1 hour) to the traditional Mayan village of Tixkokob. 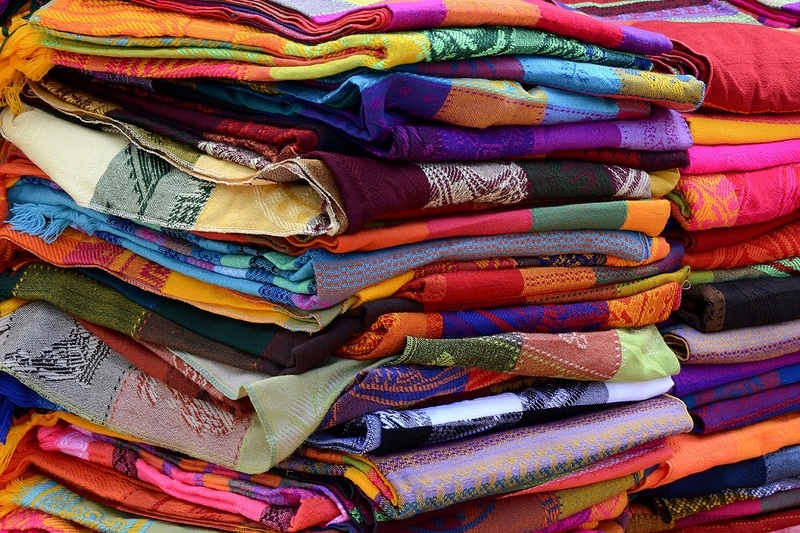 Here you will see how local families still practise the age-old tradition of hammock weaving as well as visiting a local bakery before transferring (approx. 45 min) in the late afternoon to Merida, the White City, your base for the next 2 nights. Drive (approx. 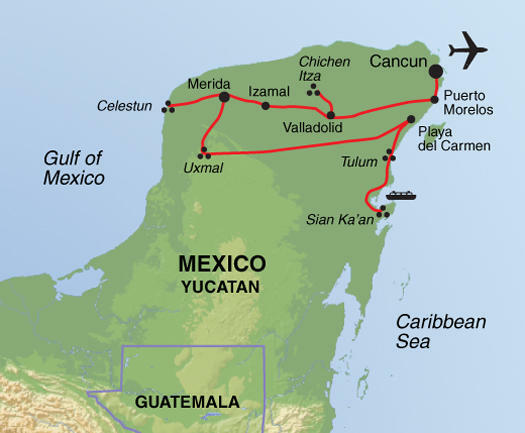 1 hrs 30 min) to the UNESCO World Heritage Site and World Biosphere Reserve of Celestun. Boarding speedy motorboats, you will navigate the winding canals and discover this immense mangrove and wetlands complex including a visit to the permanent colony of Pink flamingos who call this beautiful area home. Returning to the dock, you will head to the town of Celestun for a delicious treat of local seafood delights in the shade of our thatched roof restaurant located on the edge of the Gulf of Mexico. After lunch there is free time to enjoy the beach before returning to Merida (approx. 1 hrs 45 min) where the rest of the afternoon is free to do as you please. After breakfast, you will go on a historic city tour of Merida, considered the cultural capital of the entire Yucatán Peninsula and referred to as the White City because of all its white painted buildings and the use of limestone bricks and tiles that decorate much of the exteriors. The tour includes seeing colonial architecture, churches and other monuments of Yucatán’s thriving state capital before finishing with a ‘Calesa’ ride (horse carriage ride). You will then be transferred (approx. 1 hr 15 min) to Uxmal, where you visit the Choco Story Museum to learn everything about chocolate! Your visit to the museum includes a demonstration on how chocolate was prepared using an ancestral recipe, the chance to learn about the making of ceramics, experiencing a Mayan ceremony and of course tasting a freshly made chocolate beverage. The rest of the afternoon is free to relax or perhaps enjoy your hotel swimming pool in Uxmal. This morning you will take a guided tour of another UNESCO World Heritage Site, the famous Mayan temples of Uxmal. Considered a true highlight of the Yucatán, this classic 10th Century Mayan site is one of the most complex and impressive expressions of Puuc architecture. Accompanied by an expert guide, the Mayan mysteries of the region with be revealed to you as we learn about its engineering, architecture and society. 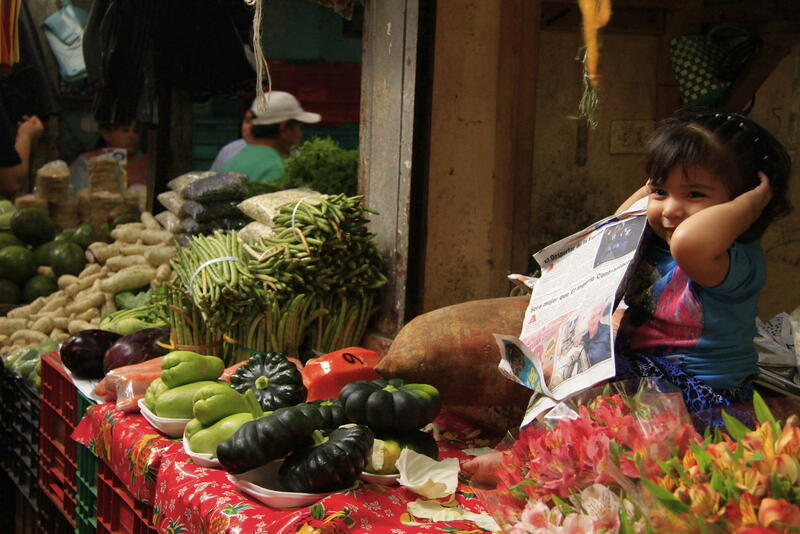 After your tour, you can participate in a fun scavenger hunt that requires you to search for a variety of clues that will draw on all that you have learned so far in this magical region of Mexico. To succeed, you will need a combination of intellectual acuity, mental fortitude, physical prowess and of course, creativity! Following the scavenger hunt and having worked up an appetite, there is the chance to have a traditional Yucatecan meal at a local Mayan family restaurant. Here you have the option to order a gastronomic gem of the Yucatán Peninsula: slowly cooked pork (Cochinita Pibil) or chicken (Pollo Pibil) with achiote paste wrapped up in banana leaves, a classic meal! The rest of the afternoon is free to enjoy at your leisure. Following breakfast, you bid farewell to Uxmal and travel (approx. 3 hrs and 30 min) across the Yucatán Peninsula to the natural protected area of Punta Laguna; home to a small Mayan community along with 500 spider monkeys and a few howler monkeys. Covered in lush vegetation, this ancient jungle is inhabited by a vast variety of trees including a sacred 700-year-old Pitch tree where traditional Mayan blessings are conducted. Today, the small Mayan community that lives here consists of around 30 families that organise different activities such as hiking, bird watching, monkey watching, zip-lining and rappelling. Punta Laguna is a wonderful example of how local people can manage tourism whilst still retaining complete respect and conviction to protect their natural and cultural heritage. After your visit to Punta Laguna, including a picnic lunch, you will be transferred (approx. 2 hours) to Playa del Carmen arriving in the late afternoon. Playa del Carmen will be your base for the last four nights of the tour. This morning you will be driven (approx. 1 hr and 30 min) to visit the Sian Kaán biosphere reserve. Meaning ‘origin of the sky’ in Mayan, this special biosphere reserve is made up of a large water system, marshes, mangroves and a virgin tropical forest. Upon arrival at the reserve, you will take a short hike through the jungle to the Muyil Maya temple, before walking along a wooden pathway by the water’s edge to board a boat and continue our tour. 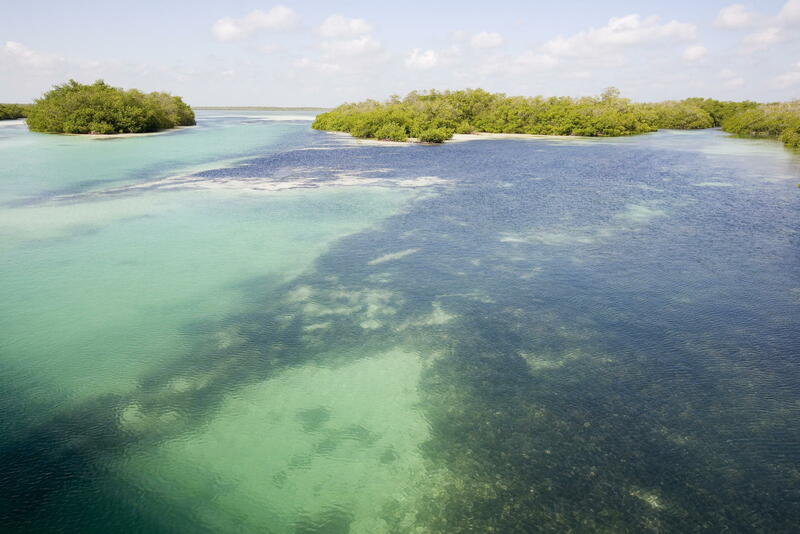 Accompanied by an expert guide, you will explore the reserve by water including discovering a cenote (sinkhole) that lies underneath the surface. During our visit, there is also the chance to swim in the clear waterways or float along the ‘lazy river’. After arriving back on dry land, you take a short drive (approx. 30 min) on to Tulum. Upon arrival in Tulum, there is the opportunity to have lunch before you visit the archaeological site of Tulum (meaning wall in Mayan). 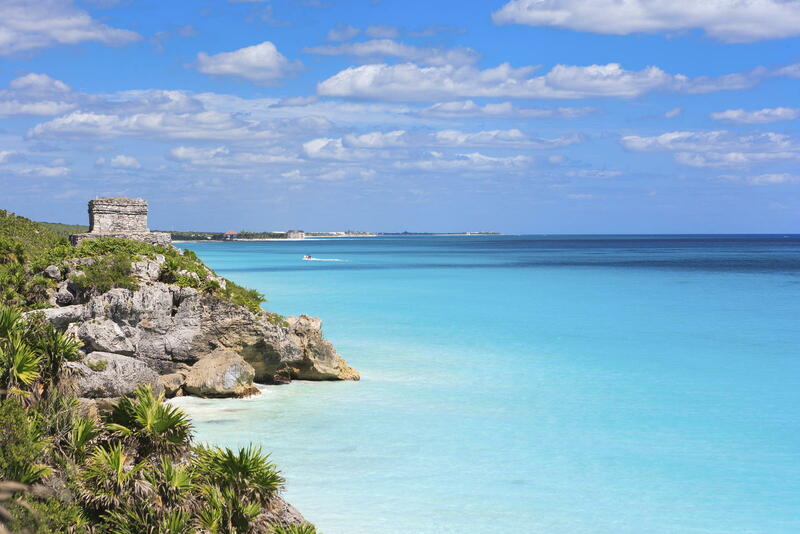 While Tulum is not the largest of Mayan archaeological sites, it is considered to one of the most beautiful due to its striking location; set on 15-metre high cliffs above the sea. Also known as Zama, or city of dawn, Tulum was the only Mayan archaeological site to be in use at the time of the Spanish conquest. After visiting Tulum you transfer (approx.1 hour) back to your hotel in Playa del Carmen. This morning following breakfast, your leader will take you on an orientation walk of Playa del Carmen, considered one of Quintana Roo’s trendiest beachside cities. The rest of the day is free for you to enjoy at leisure. Your leader will also be able to advise locally of optional activities available. Today is a free day for you to relax, swim in the pool or enjoy the Caribbean beach. As your hotel is centrally located in Playa del Carmen, all services can be found close by and the beach is within walking distance. This evening you will meet the rest of your group for a farewell dinner. You are free to leave at any time today.